While there is currently no imminent asteroid threat and none of known near-Earth objects (NEOs) is on collision course with our planet, humanity should be prepared for the worst. With that thought in mind NASA and ESA are developing the Asteroid Impact and Deflection Assessment (AIDA) mission, which main goal is to demonstrate the kinetic impact technique that could change the motion of a potentially hazardous asteroid. The AIDA mission will consist of two spacecraft sent to the binary asteroid called Didymos. 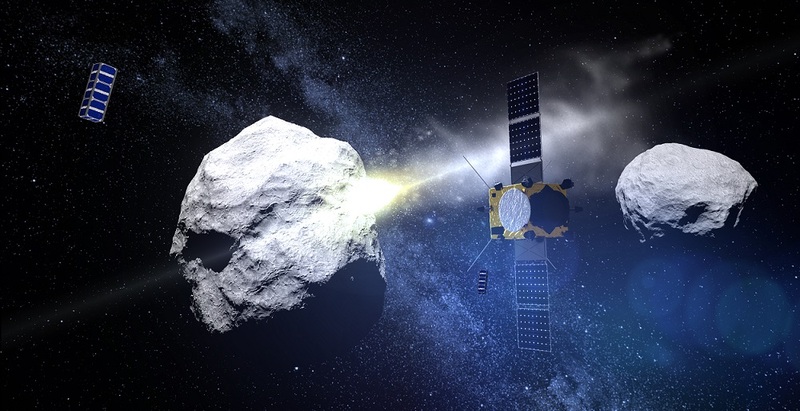 Built by ESA, the Asteroid Impact Mission (AIM) will be launched in October 2020 and is expected to be injected into the orbit of the larger asteroid. NASA’s contribution to this endeavor, the Double Asteroid Redirection Test (DART), will be launched into space nearly one year later and slated to crash into the smaller asteroid in October 2022. AIM will be just in place to observe the impact and study its aftermath. “This mission, in partnership with ESA and NASA, will allow us to validate the technology of the kinetic impactor and also to improve our understanding of threatening asteroids,” Patrick Michel, AIM/AIDA investigator at the Côte d'Azur Observatory (OCA), told Astrowatch.net. Therefore, the mission would be essential for the most one of the most important asteroid deflection technology – the kinetic impactor. In particular, AIDA will demonstrate the feasibility of this technique based on the data gathered by observing DART’s crash into the Didymos’ moon with a velocity of about six km/s. AIM will orbit the asteroid in order to perform detailed before-and-after observations of the structure of the space rock itself, as well as its orbit, to thoroughly characterize the kinetic impact and the consequences. “To make sure a technique is valid and that we know how to use it, we need a test. Otherwise, we can talk but it will remain on paper and we cannot guarantee anything. And this is why we still push for the AIDA space mission to happen,” Michel said. He noted that the success of AIDA will have many implications for planetary defense, science and asteroid mining because the knowledge needed for these three aims is essentially the same. According to him, it will prove that asteroids are the only natural risk that we can predict and prevent by making the necessary steps. “AIDA, if done, will accomplish the step that will allow us to tell the future generations: we did our duty, we have now a validated tool to prevent the risk! And it will also come with science and technology returns, which contributes to inspire young generations,” Michel noted. The AIM spacecraft is still in its conceptual phase. When it comes to DART, the probe was recently moved by NASA from concept development to preliminary design phase.